Resilience is an evidence-based, integral and practical solution to the human dimension of work. Building resilience mitigates problems like depression, distress and illness. It liberates the potential in our people to be well, effective and whole. Resilience is a foundation and goal of strategy. 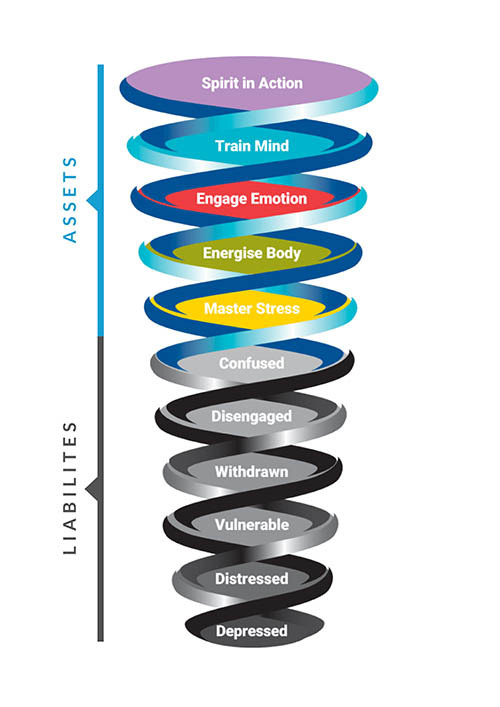 We face a variety of part solutions – EAP, insurance, wellness, EQ, mindfulness, etc. – that can trivialise the importance of preparing and challenging your people to be at their best on the job and at home. Resilient people are calm, energised, engaged, focused and creative. A resilient organisation serves with vision, humility and care. It is adaptive, innovative and tenacious. It is a force for good. When your organisation is resilient you will attract resilient people. This virtuous cycle separates the truly great from the average. The Resilience Institute has a proven solution to measuring the human dimension, targeting the right investments, and delivering the results that underpin success. Let’s see what 26,099 people can tell us….. This is the introduction paragraph in a bigger font. The quick fox jumps over the lazy dog because it is fun. The quick fox jumps over the lazy dog because it is fun. The concept of resilience is valid, topical and meaningful. An investment delivers important returns to the participant and the sponsoring organisation. Men and women are different in both their needs and their response to interventions. The engagement of the CEO in the language and behaviours of resilience is the key to a successful programme. In the age of post truth politics, environmental instability, digital overload and declining benefit funding, we need resilience more than ever. It is a primary leadership responsibility. How we build leadership capability. Phasellus porta efficitur sagittis. Suspendisse eu purus dui. Pellentesque vitae egestas mi. Quisque sagittis justo sed rutrum pharetra. Suspendisse sem nibh, vehicula vel ligula at, convallis iaculis arcu. Phasellus et turpis rhoncus, eleifend ante et, auctor justo. Pellentesque habitant morbi tristique senectus et netus et malesuada fames ac turpis egestas. Aliquam varius justo sed convallis posuere. Proin auctor venenatis fermentum. Sed fermentum sem non risus ultrices semper. We see a 30% decline in relaxation practice over 6 years with work intensity up, fitness and impulse control down. Our data shows that 45% of participants experience chronic distress, 50% are hypervigilant and 55% worry excessively. Stress is reported to be the highest in 10 years (American Psychologic Association), costing the US $300 billion1 and Europe, Î272 billion2 in lost productivity. Given the clear evidence accumulating daily on relaxation, meditation and biofeedback, we can solve this painful and expensive problem with very simple practices. 5. So, what can we do? The topic of resilience demands attention, understanding and ongoing research. We have a lot to learn about what is needed and what works. There is no time to waste. The CEO and Leadership team of every organisation (and country) must front this initiative. When they do, things change for the better3. When they turn away, we are all at risk4. Resilience is a global concern and a force to unite cultures and nations. It affects every one of us in deeply real and personal ways. Do we really want to fill our children with antidepressants, anxiolytics and stimulants? Would every parent not prefer their child to learn resilience at school? When we assess and train resilience, we must respect that the needs and responses of women are quite different to those of men. Respect this diversity. Resilience increases with age and there are times in life when we are most vulnerable and also windows for rapid learning. Not everyone is enjoying the current age. Many are spiralling into a destructive distress which is disabling organisations, families, schools and nations. Quite clearly, people can learn to bounce, to calm themselves and to focus attention. I think this is where we should start.